How the Heck Do You Team Draft? Team Draft is likely the least-played format currently in rotation at the Grand Prix level. Usually at Limited events, the first day is Sealed and the second day is Draft. At Team Sealed events, both days are Sealed and only the Top 4 get to play this intricate, amazing format. It's a six-person, three-on-three draft where teammates are flanked on both sides by opponents. It looks like a normal draft, but the strategies are much different. 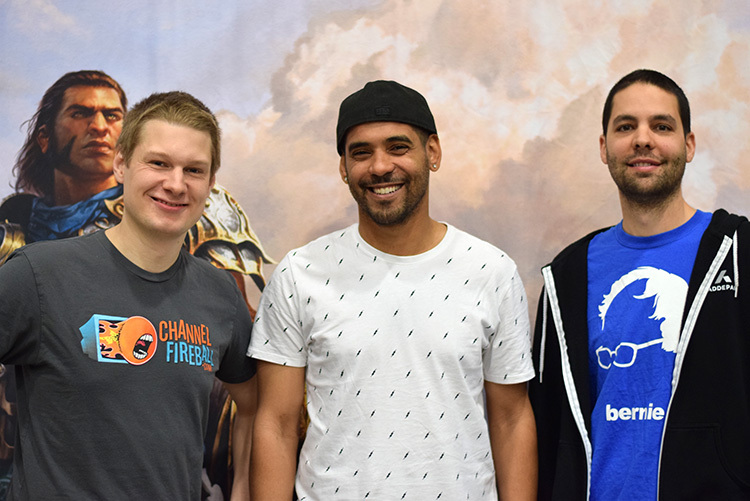 I sat down with the only 10-0 players here at Grand Prix D.C., who happen to be a bunch of names you'll recognize: Matt Sperling, Dave Williams, and fourth-ranked Paul Rietzl. 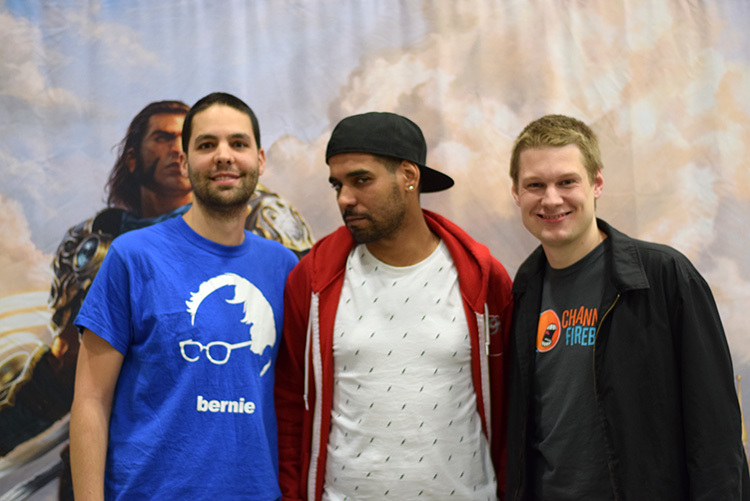 Though Rietzl admitted that he's more of a Team Rochester Draft man (a format where all the cards are drafted face-up, it's pretty crazy), Williams is well-known for his love of Team Drafts. It's not hard to understand why. Six of his ten Grand Prix Top finishes are in a team format—and the last two were with this exact team configuration. “It's the best,” Williams said simply. What do you need to know going into your first Team Draft? Because it can be slight disorienting. Rietzl mentioned up front the most important concept to ingrain. “In individual draft, if you only care about your cards, it's a small mistake ... but in teams you're literally draft two other players' decks so you have to care about everything.” He's talking of course about your teammates' deck you're also helping to craft during the draft. “A lot of it boils down to hooking and cutting,” Rietzl said. But these terms are unfamiliar to many readers. Let's break them down. “Cutting” is likely something you've heard. When you don't want a card for your own deck, but you don't want another drafter to have it, you can pick that card and “cut” it from that person's deck. If you hear pros talk about cutting, they are usually saying how it's not worth it. Cutting is a losing strategy in an individual draft. The marginal utility of a narrow sideboard card is likely better than a good card that you have a low likelihood of seeing. But Team Draft is a big exception. Because even if you personally don't play against scary card, it's guaranteed that it will be played against your team. So pick evaluations change drastically in Team Draft right off the bat. A card like, say, Elemental Uprising, should almost never be taken over a good card in a color you think your opponent is playing. You don't want to seal a teammate's fate. The complete opposite of “cutting” is “hooking.” Instead of taking the best card, you purposefully pass the best card to your opponent. This will, hopefully, “hook” them into a color. Right after your talons are in good and deep in a single color, “cut” them hard and draft that same color yourself. “It's often the best thing you can do in the format.” Matt Sperling said. This ends with your opponent having either useless off-color cards, or five good cards in a color, and the rest mediocre-to-bad ones. You need to start hooking early, so that after you've passed a couple “can't-pass” cards, you make sure they only get “can't-take” cards for the rest of the pack. If you've done it right, it's a thing of beauty. Sometimes in Team Draft Heaven, the team noted, everyone on the opponent's team is drafting the exact colors of the person passing to them. That's the true Hook & Cut end goal. “Everyone on their team is getting the leftovers,” Sperling said. Now that we understand hooking and cutting, what's the next level? How can you make sure you're not getting hooked then cut? Sperling talked about different card evaluations to solve this conundrum. 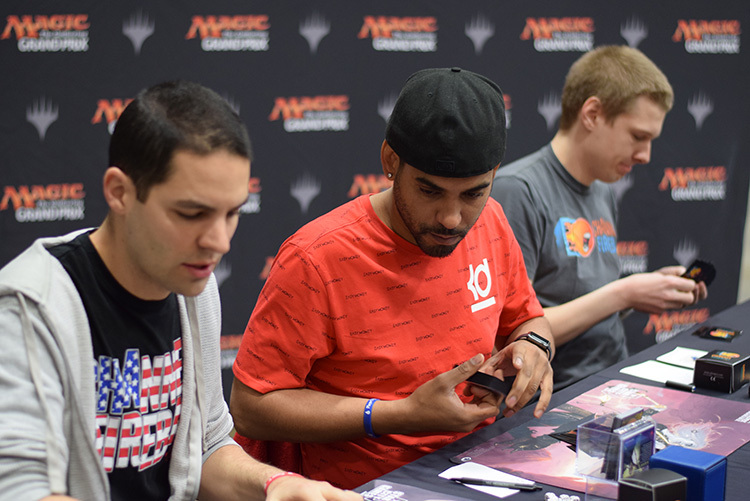 “Always be ready to switch colors and strategies ... You can't put on the blinders after four good picks.” The two-time Pro Tour Top 8–finisher said. We all know this idea, you get four great single-color picks in a row, and you're definitely in that color. Not in Team Drafts. “Flexible cards go way up; Linear cards go way down,” was how Sperling summed it all up. Now we get the hook-and-cut. But Hooking & Cutting on an individual level can only get you so far. Even the word “individual” is anathema to Team Draft. Which leads to the second point. Because you're basically “communicating” with your team throughout the draft, but only through what the cards say, understanding can go a long way. “These advanced drafting concepts [like hooking and cutting], require a good deal of trust with your teammates,” Rietzl said. Because if you're shipping cards that you want your teammate to take, or not take, you need to understand fundamentally how your teammates think. Sperling illuminated this point with the crucial metonym of pick three. If there's a great card in the pack, there's a lot of analysis to do. Sperling says you have to ask “Why am I seeing this in a passed pack? What did my teammate take over this, and what did my opponent take over it?” And most importantly—now what do you take? Humorously, at no time did he suggest out loud actually taking the best card. We're way past mentioning that strategy, despite it being the default strategy and sometimes best. When you're purposefully shipping great cards, you better be confident your teammates are picking up what you're putting down. Literally. The last key to Team Draft is more procedural, but is just as necessary. Unlike individual drafts, every card your team doesn't have is a card that could be played against you. So you have to take extensive mental notes on what you didn't take. Sperling said, “Note all the bombs and tricks you pass.” And you will pass bombs. This is something not common in individual drafts. Firstly, because if you've got your opponent in the colors you want them, it could get through to your team; and for a second more nuanced reason, which Paul Rietzl illuminated. “It's the format where you're most likely to pass a [Wrath of God effect].” Because even if you team doesn't get it, if you've taken those mental notes, you'll know who got it and you can play around it. Board sweepers are often cards you can play around, as a lot of their power in limited comes from being a rarely seen card. But you have to know which rares you can pass, and which ones you can't. Both Rietzl are Sperling expounded, “There's a big difference between rares you can play around and truly ‘broken' [or ‘bomb'] rares.” If you're doing the first two steps right, when to take which card will be more clear. But likely not crystal, because there's always a fluidity and flexibility in teams you just have to get used to. Step 1: Remember all the tricks and bombs you passed. Step 2: Communicate that information to your teammates. Step 3: Play around all the cards, because you should know where they are. It will surely take practice to fully comprehend and implement these difficult strategies, but it's more than worth it. There's a good reason that the pros love Team Draft. It's one of the reasons for wanting to Top 4 at events like this—just for the opportunity to Team Draft at one of the highest levels.